Inmates in California are being paid $1 dollar an hour to help combat the raging Camp Fire in Butte County that has already taken the lives of at least 40 people and is now being categorized as the deadliest fire in the state’s history, reported CNBC. The California Department of Corrections and Rehabilitation (CDCR) has a volunteer program that pays inmates $2 daily and $1 hourly when fighting active fires. Inmates can also earn time off their sentences for participating. Some 200 inmates are fighting the Camp Fire in northern region of California that has killed 42 people and left another 228 unaccounted for since its conception on Nov. 8, CNBC reported. 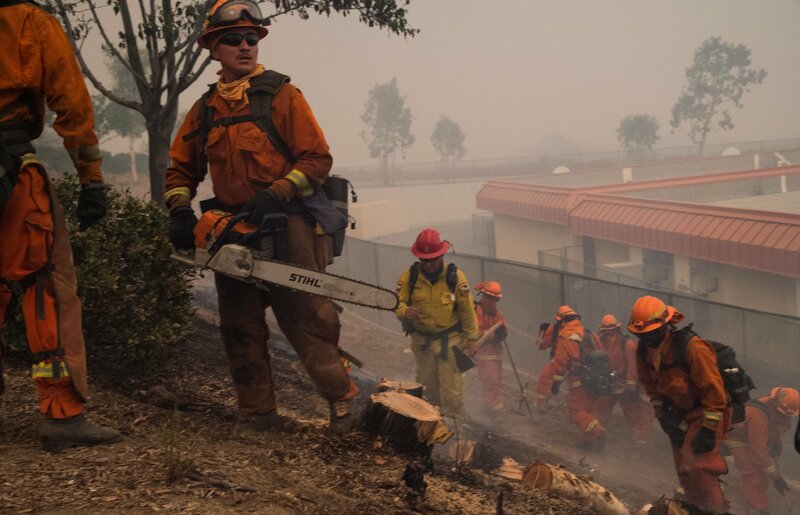 The inmates, who must be selected by the CDCR, assist firefighters in the physical labor involved with combating the wildfires, including cutting brush and trees, clearing and maintaining hiking trails and unclogging storm drains and flood channels. “Each volunteer inmate is evaluated individually to ensure that all those selected for the camp program are willing to be team members with nonviolent behavior, even if their original conviction was for a violent crime,” CDCR representative Vicky Waters told CNBC. The program can be traced back to 1915, and in August more than 2,000 inmates joined over 14,000 firefighters in combating the Mendocino Complex Fire, which was the state’s largest fire before the Camp Fire. While critics argue the meager pay is not enough in turn for risking inmates’ lives, others argue that inmates are often very open to the opportunity to show their progress and growth. CDCR says the program saves the state between $90 and $100 million a year, but it costs an average $70,812 per year to incarcerate inmates in California, according to the Legislative Analyst’s Office, a nonpartisan organization that provides the state legislature with fiscal and policy advice. Under that expense is $2,437 that goes toward rehabilitation programs. “When prisoners do volunteer work, it’s especially important that we make absolutely sure that they’re making a free and uncoerced and truly voluntary choice,” director of the American Civil Liberties Union (ACLU) National Prison Project, David Fathi, told WBUR. “That’s especially important when the work they’re doing is very dangerous, like fighting wildfires,” he warned. Lisa Graybill, Deputy Legal Director at Southern Poverty Law Center, told Newsweek in August that inmates are sometimes so eager to demonstrate their rehabilitation that they’ll put themselves in risky positions, like fighting deadly wildfires.